Former Kiwi, Beauty's Beast, impressed in first public hit-out for trainer Danny O’Brien at Cranbourne. O’Brien is hoping recent stable acquisition Beauty’s Beast can measure up to the $1 million Emirates Stakes (1600m) at Flemington in November. The former Kiwi - who was last seen recording an impressive win in the Listed South Pacific Classic (1400m) at Randwick in April – scored a narrow but impressive trial victory in the opening heat over 990m at the Cranbourne Training Complex. Jumping straight to the lead for jockey Damien Oliver, Beauty’s Beast held off a quality field to record a half-head victory over Escado, with Nautical running on strongly into third and Politeness further back in fourth. 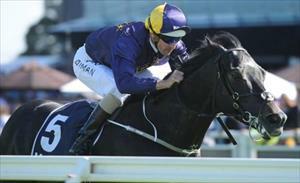 O’Brien said the initial objective was to try and lift the son of Guillotine’s rating. “He’s a promising lightly-raced horse that we’re hoping we can get into Stakes company in the Spring,” O’Brien said. “His rating means he’ll still get in on the minimum in an open handicap so we’ll kick him off on the September 20 at Caulfield in 1400m open handicap. “If he’s progressing the right way then he’s a horse that we might look at aiming towards the Emirates Stakes on the last day of the (Melbourne Cup) Carnival. Though stable mate Caravan Rolls On wasn’t able to beat a runner home in the same trial, O’Brien said the Sandown Cup (3200m) winner was on track to make his return from injury in a 1600m handicap at Moonee Valley on Saturday. “He’s a lightly-rated stayer that's a long way off getting a run in the bigger staying races,” he said.